We travel with you because any time something doesn’t seem right, or isn’t right, it gets fixed. Don’t have the seat assignments you thought you had in London? - fixed. I have booked two trips with Viking Cruise and Travel. Both of the trips have been to Alaska. They share my love for and interest in Alaska. They know what I like and are great about sending me info on trips they think might appeal to me. I would not hesitate to recommend Viking Cruise & Travel to friends and family. We can always depend on you to answer our travel questions. Thanks for all you do to make our vacations great. Thank you for making this so pleasant an experience. I have used your travel agency for the last three years. You are always there to answer my questions when I plan new trips and to make really great bookings that meet my budget and travel desires. You are a delight to work with and very thorough. What could be better? Drilling began on the four faces of Mount Rushmore National Memorial in 1927. 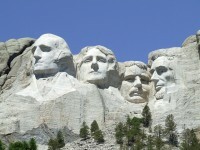 Towering 6,200 feet, the faces of George Washington, Thomas Jefferson, Theodore Roosevelt and Abraham Lincoln are scaled to men who would stand 465 feet tall. Creation of the Shrine to Democracy took 14 years and cost a mere $1 million, though it's now deemed priceless.